This week we will look at some of out purveyors of ‘higher education’. We have been told by our politicians that more money turns out better students. When principles that made this nation great are discarded all the money in the world will not turn out an educated product. Now for a few more stories of education in this nation. And some churches want to discard voter guides as being contrary to the purpose of church. When we do that we get what we get. Many voters will not take the time to research candidate backgrounds and will vote for the one who has the most TV adds and signs by the road. Let’s get started. Because of relentless anti-American indoctrination our recent college graduates may be deep in debt and dumber than dirt. A survey showed that nearly 10% of recent college graduates say television star Judith Sheindlin is on the Supreme Court. [“A Crisis in Civic Education”, American Council of Trustees and Alumni, January 2016]. It would appear that ‘Judge Judy’ has been elevated to the level of Justice John Roberts Jr. and Justice Clarence Thomas, et al. The American Council of Trustees and Alumni (ACTA) describes itself as an independent organization committed to academic freedom, excellence, and accountability in America’s colleges and universities. Their surveys have uncovered a crisis in American civic education. Their findings reveal that recent college graduates are alarmingly ignorant of American heritage and history. [Ibid]. Their study reported that students could not identify the father of the US Constitution or name one of our First Amendment rights. No wonder so many support curbing free speech. The Pew Research Center released a survey that showed 40% of Americans between the ages of eighteen and thirty-four believe the government should be able to ban any speech that is offensive to minority groups. [Jacob Poushter,”40% of Millennials OK With Limiting Speech Offensive to Minorities”, Pew Research Center, November 20, 2015]. (Has there been a spike in the sale of crying towels or coloring books?) To be honest, appointing Judge Judy to the highest court in the land could make good sense. It could use a good dose of common sense in its courtrooms. Not only are our taxpayer-funded universities and colleges churning out boatloads of ignoramuses, but our education system wants to whitewash America’s recent history as well. All the while our ‘higher’ level…and I use the term loosely…are being paid six and seven digit salaries. Next we will see how diversity may very well mean anything except Christianity. When a twelve year old brought home her vocabulary list it caused her mom to take notice. The list at High Mount School in Swansea, Illinois, included such words as jihad, Islam, Muhammad, and Koran according to the Belleville News-Democrat. [Mary Cooley,”‘Drawing the Line’: High Mount Parent Upset With Muslim History Unit”, Belleville News-Democrat, October 16, 2015]. An upset mother flipped out when her daughter asked,”What’s Koran mean?” Her public school history class was teaching Islam 101. When she queried Superintendent Mark Halwachs about the lessons on Islamic vocabulary, he said it was all about teaching tolerance. He went even further to tell the newspaper about what happened on September 11, 2001: “It wasn’t a religion that did that. It was bad men that did that.” [Ibid]. I hate to disappoint our courageous educator but when the extremists flew jet liners into the Twin Towers they were not hollering,”Jesus Saves”. However, the school district’s definition of tolerance does not seem to include in-depth, theological discussions about Christianity. According to this stalwart educator you can teach about religion, you just can’t endorse or support one religion over another. I wonder if he tells students that if they go to an Islamic country and teach about Christianity they will probably find their heads on a platter? You can’t say Jesus is the one and only. [Ibid]. Sounds like the folks at High Mount School need to add another word to their vocabulary list: indoctrination. I can’t find any indication of church involvement in this story. Our next situation at least involves a Christian law firm. It would appear that the only approved indoctrination in public schools these days is non-Christian or anti-Christian…and it’s those 85% who claim to be ‘Christians’ who have allowed it to happen. Today a child is in greater danger of discipline by bringing a Bible to school than bringing a peanut butter sandwich. One public school in California…you might know…ordered a seven year old boy to stop handing out Bible verses during lunch…and dispatched a deputy sheriff to the boy’s home to enforce the directive. [Renee Eng,”Palmdale Student Ordered to Stop Handing Out Bible Verses”, Charter Communications, June 17, 2016]. The first-grader who attends Desert Rose Elementary School in Palmdale, along with his parents are being represented by Liberty Counsel, a Christian legal group. [“School Calls Sheriff to Stop 7-Year-Old From Handing Out Bible Verses”, Liberty Counsel, June 2, 2016]. Christina Zavala, the boy’s mother, made it a practice to include a Bible verse and encouraging note in her son’s lunch bag. The boy would tell his friends about the notes and read them aloud at the lunch table. Before long children were asking for copies of the notes. His mother obliged by making copies and including a brief note to explain the daily Bible verse. A few days later Christina received a call from a teacher and told her that “her son would no longer be able to share Bible verses because he was not allowed to share ‘such things’ while at school.” The school would only allow the boy to distribute Bible verses outside the school gate after the bell rang. [Richard L. Mast Jr. and Mary E. McAlister, Liberty Counsel, letter sent to Palmdale School District via e-mail on May 25, 2016]. The boy could also no longer read or share Bible verses at lunch…with the school citing “separation of church and state”…may the person who came up with that lie find a hot spot in hell. As good parents wanting to set an example for their son, they started helping the boy give out Bible verses outside the school after the bell rang in accordance with the unconstitutional edict. But even that was too threatening to the ‘cowardly’ school principal, so in a few weeks he implemented a complete ban on the Bible verse sharing…and some wonder why we have such problems in schools. The boy and his father were told to move to a public sidewalk. The boy and his father complied but in a few hours the Zavala family had another visit…a deputy sheriff who had been sent by the school. [Ibid]. The deputy went on to tell the parents that the school was worried someone might be offended by the Bible verses. [Richard Mast in communication with Todd Starnes, June 2016]. Would the school preferred an ‘active shooter? The deputy’s visit appeared to be a ‘friendly’visit. Apparently all the real criminals have been dealt with in Palmdale…and now they are going after kids who share Bible verses at lunchtime. [Horatio Mihet in communications with Todd Starnes, June 2016]. What’s next…shut down all the lemonade stands? It was obvious that the deputy’s visit was meant to intimidate the family. You might expect something like this in Communist Romania, Nazi Germany…or Florida. 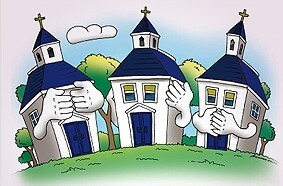 It appears to be part of a broader agenda to remove God from the nation’s classrooms. At times a lowly student with faith in God can do more to stand up to the secular world than a church that hides behind its walls, fearful of offending someone. Once again I have found no evidence of a local church taking a stand with the boy or his parents. It would be nice if these were the only stories I could come up with to illustrate the failures of some religious institutions but sadly it’s not. More to come next week.